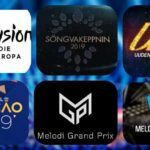 The Portuguese national selection for Eurovision 2019 kicked off tonight, as the first semi final of Festival da Cançao took place. Hosts of the show that was held in RTP’s studios in Lisbon , was Sónia Araújo & Tânia Ribas de Oliveira. Festival da Cançao 2019, will consist of three shows (two semi finals and one final) and total of 16 acts will be comepting this year. This evening we watched the first set of 8 contestants compete in the 1st semi final round.